SimplesCalendar is an intuitive calendar that lets you quickly plan appointments, tasks and events, as well as filter the information to find the data you need. The program lets you enable a feature called SingleClick mode, after which you can select a date and write up to three lines of text. It’s also possible to use preset lines from drop-down menus and insert a time of day. 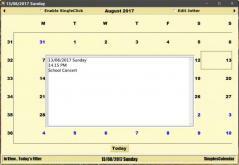 To view all stored notes for a specific date you need to right click on the calendar and select the day.